Two clock domains are not synchronized but can we still test it? 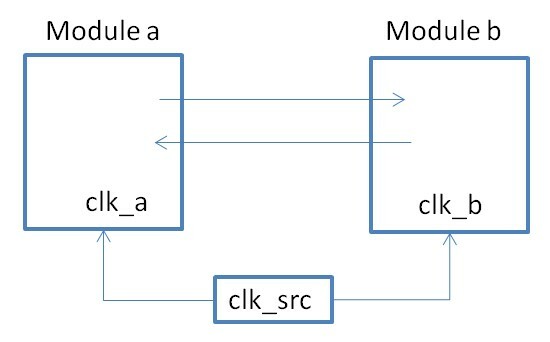 Asynchronously Move Data Between Two Modules which Reside Far Away on Die? As simple as it can be. Module a and module b talk to each other. Their clocks come from the same source and by design two clocks need to be synchronized. There is no synchronizer inside either module. But unfortunately timing constraint has two clocks specified as ASYNC. So obviously this circuit does not work. But this is ASIC. Re-spin a chip is very costly and timing consuming. It is very important if we can work-around this issue and continue testing the chip. There could be other issues to be found and fixed before the next chip spin. You don’t want to do a round of spin for each issue you have. Otherwise it is better for you to quit hardware and become a firmware engineer. The following is author subscription content. To gain access you can subscribe to this author's posts at Subscription of SD-RTL-DGN Posts. Subscription is valid for three months. We are a small team of ASIC and FPGA design engineers with combined >40 years of experience. We successfully led several chips through the whole design to TO process. Familiar with Xilinx FPGA, we designed complicated system of using multiple FPGAs to verify complicated ASIC and also for the final products. We are interested in working as independent contractor for your projects. Feel free to contact us.